Autopsy Saw With Vacuum Dust Collector prevent inhalation of bone fragments while performing autopsies with this vacuum that is attached to Mopec saw. It has Strong motor with a capacity of 13,000 RPM. The Autopsy Saw is light weight, efficient, durable. It comes with set of 2 blades. The hand piece has safety flange permitting firm grip and stays cool during operation. The Set of screw wrench for exchange of saw blades. The motor is provided with long service cord with plug and integrated with hand piece. The suction performance is 1.380 Watts. The Air flow rate is 57 I/min. The Vacuum is 235 mbar. The volume of container is 35 Liter. The noise level is 63 dB. The weight is 9.5 kg. 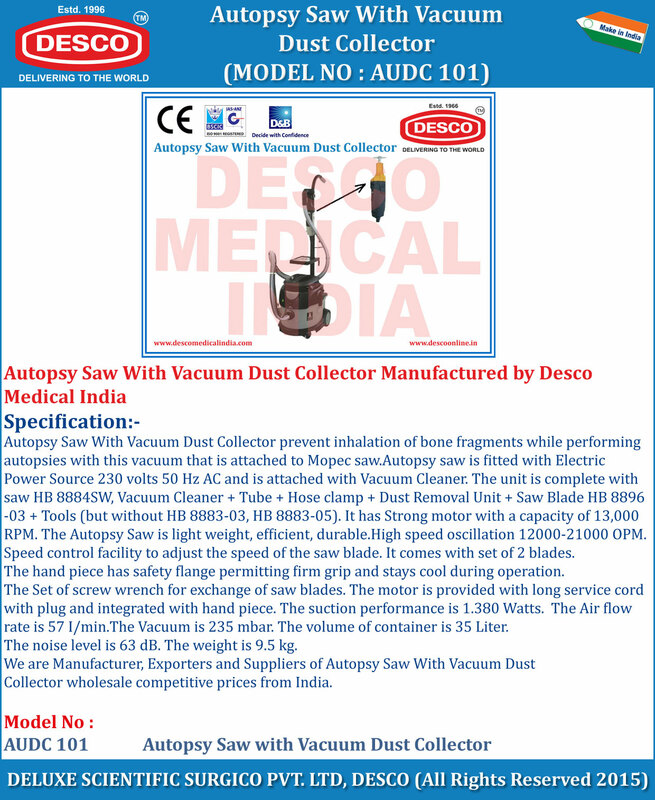 We are Manufacturer, Exporters and Suppliers of Autopsy Saw With Vacuum Dust Collector wholesale competitive prices from India.